A key feature of SLR cameras is that they allow you to concentrate on shooting while looking into the viewfinder. An easy-to-see viewfinder image is essential in SLR shooting. VR (Vibration Reduction) function built into the lenses provides stable viewfinder images as well as blur-corrected captured images, letting photographers concentrate on subjects and compositions for comfortable shooting. The stable viewfinder image makes it easy to place a focus point on a target area. What's more, because blur-corrected images reach the AF sensor and metering sensor, precise focusing and exposure metering are achieved. 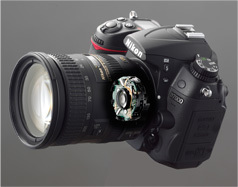 Nikon VR is the best choice for SLR users as the most reliable blur-correction system.